Entrodex Probiotic Vitamin Supplement is a soluble probiotic which contains guaranteed viable friendly bacteria, vitamins A D and B complex, electrolytes and a source of dietary energy from soluble carbohydrate. 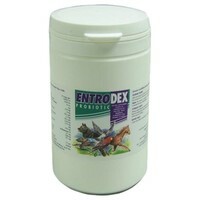 Entrodex has been independently proven to contain more robust viable friendly bacteria tan may other branded probiotics. Use Entrodex regularly at 5gms (one measure or teaspoonful) per litre of fresh clean drinking water and see the difference that makes all the difference. Entrodex can be administered via the drinking water or added to moist food.